'Into the Badlands: The Complete First Season' will drop November 8th. AMC’s hit martial arts series “Into the Badlands: The Complete First Season” arrives on Blu-ray™ + Digital HD and DVD on November 8, 2016 from Anchor Bay Entertainment. “Into the Badlands” was created by showrunners/executive producers/writers Alfred Gough (Spider-Man 2) and Miles Millar (Spider-Man 2) and executive produced by Oscar®-nominated producers Stacey Sher (The Hateful Eight) and Michael Shamberg (Django Unchained), director David Dobkin (The Judge) fight directors Stephen Fung (Tai Chi Zero) and Daniel Wu (Warcraft). Set in a world centuries from now, “Into the Badlands: The Complete First Season” focused on the spiritual journey of Sunny (Wu) and M.K. (Aramis Knight), a teenage boy who harbors a unique ability, and their growing relationship as teacher and student. Both discover their true purpose and decide to explore what lies beyond the borders of the Badlands, but as their Baron Quinn continues to battle against his own family as well as his rival Baron The Widow, Sunny and M.K.’s journey to a more peaceful existence seems further out of reach. Including featurettes delving deeper into the world of the Badlands, the making of the fight scenes, the characters of the series, the digital comic and more, the Blu-ray and DVD will be available for the suggested retail price of $49.99 and $39.98, respectively. In addition to Wu and Knight, “Into the Badlands” stars Marton Csokas (The Lord of the Rings: The Return of the King) as Quinn, Oliver Stark (“Luther”) as Ryder; Emily Beecham (28 Weeks Later) as Widow, Orla Brady (“Dr. Who,” “Fringe”) as Lydia, Sarah Bolger (“Once Upon a Time,” “The Tudors”) as Jade, Ally Ioannides (“Parenthood”) as Tilda and Madeleine Mantock (Edge of Tomorrow) as Veil. 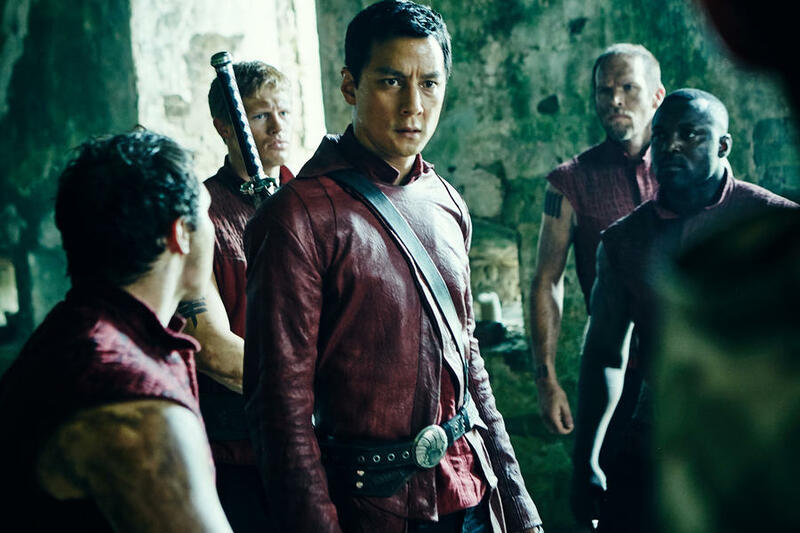 “Into the Badlands” Season 2 will return to AMC in 2017. AMC is home to some of the most popular and acclaimed programs on television. AMC was the first basic cable network to ever win the Emmy® Award for Outstanding Drama Series with “Mad Men” in 2008, which then went on to win the coveted award four years in a row, before “Breaking Bad” won it in 2013 and 2014. The network’s series “The Walking Dead” is the highest-rated series in cable history and the number one show on television among adults 18-49 for the last four years. AMC’s other current original drama series include “Better Call Saul,” “Hell on Wheels,” “Turn: Washington’s Spies,” “Halt and Catch Fire,” “Humans,” “Fear the Walking Dead,” “Into the Badlands,” “The Night Manager,” “Preacher,” “Feed the Beast” and forthcoming “The Son” and “The Terror.” AMC also explores authentic worlds and discussion with original shows like “Talking Dead,” “The Making of The Mob,” “Comic Book Men,” “Ride with Norman Reedus,” “The American West” and “Geeking Out.” AMC is owned and operated by AMC Networks Inc. and its sister networks include IFC, SundanceTV, BBC America and WE tv. AMC is available across all platforms, including on-air, online, on demand and mobile. Anchor Bay Entertainment is a leading independent home entertainment company that acquires and releases a wide array of filmed entertainment in the theatrical and home entertainment markets, including STARZ Original series, children’s entertainment, fitness (Anchor Bay Fitness), sports and specialty films on Blu-ray™ and DVD formats. The company has long-term distribution agreements in place for select programming with The Weinstein Company, AMC Networks and Entertainment Studios, among others. Headquartered in Beverly Hills, Calif., Anchor Bay Entertainment (www.anchorbayentertainment.com) is a full service distributor in the North American market. Anchor Bay Entertainment is a Starz (NASDAQ: STRZA, STRZB) business, www.starz.com.